The Prince Edward County Memorial Hospital Auxiliary was in a giving mood following another successful Festival of Trees as the organization gave more than expected toward a piece of priority medical equipment Friday. The generosity of people in the holiday spirit at Isaiah Tubbs Resort Nov. 24-26 was on full display as the auxiliary raised $40,000. Community members decorated distinct, beautiful trees that others enthusiastically bid on and the annual preserves sale and Second Time Around Shop Christmas boutique did well. 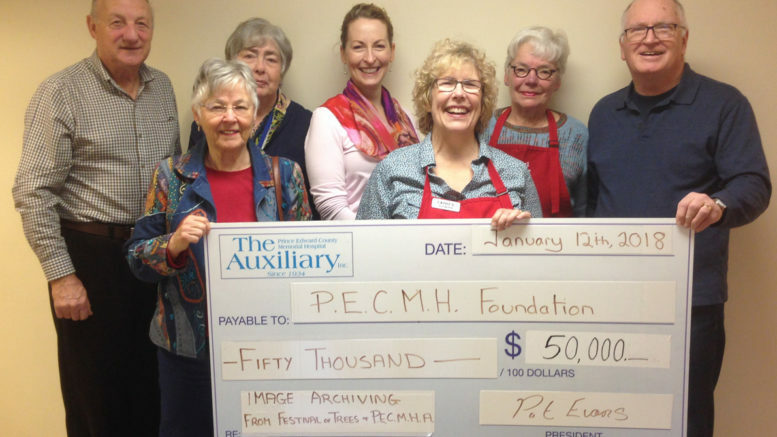 When time came to present the cheque to the Prince Edward County Memorial Hospital Foundation, the auxiliary got into the act itself, adding another $10,000 to the total. The $50,000 gift will help offset a $101,890 purchase of an Endo Works picture archive system for endoscopy department. Foundation executive director Penny Rolinski said the technology can capture, archive, and share images of specific regions of the body taken during scanning procedures. The addition — a Cancer Care Ontario requirement — will allo the hospital to continue screening for over 3,000 patients each year. The donation also provides a boost to the foundation’s Picture of Health Campaign, which is getting close to meeting a $250,000 goal. The campaign, which Rolinski hopes to successfully close in the coming weeks, will replace one colonoscope and two gastroscopes in the endoscopy clinic and support the purchase of a telemetry unit for the emergency department and a defibrillator for in-patient care. The campaign is part of a busy fundraising year as the foundation had a $319,000 target because it also had to raise funds to help with the Re-Imagine Campaign for an MRI refurbishment in Belleville. The auxiliary was also a great supporter of that campaign, providing $100,000 of the county’s $170,000 portion of the $1-million cost. Rolinski said the foundation greatly appreciates the auxiliary’s ongoing support.